January is also the time when we look forward in hope to the new year. This year at Trinity we’ll be building on our successes and venturing even farther with boldness and grace, doing what we do best: being hospitable in the name of God. In 2015, we’ll be continuing our monthly Community Coffee Hours. They’ll be held on the first Wednesday of each month at 9:30am in our Parish Hall, which can be reached by following the sidewalk on the left of the church (next to the pizza place), and entering through the black doors with the inset glass cross. We’re also looking at two new outreach opportunities, in addition to our ongoing outreach ministries. We’re looking at joining/forming an ecumenical partnership with Warsaw area churches and Literacy West in order to tutor and mentor high school aged youth as well as adults. We’re also looking at the possibility of beginning a Pet Food Pantry, the first in our area, but not the first in our Diocese. In 2015, we’ll be introducing three new services, particularly with our larger community in mind. 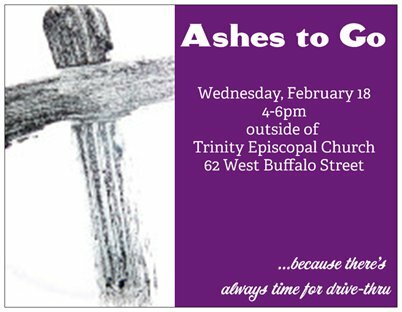 Ashes to Go, in February, will be our drive-thru Ash Wednesday offering. The Backpack Blessing, in August, will be open and available for anyone getting in the back-to-school mindset. The Blessing of the Animals, in October, will be open and available to all the pets and working animals in our community (and their people). More information on these services will be posted on this site, as they become available. Evangelism as a word can misunderstood in our culture, but it really just means ‘sharing good news’ in Greek. And that’s what we do, wherever we go. God has made our lives bearable, breathable, and beautiful, and we want to share that beauty. In 2015, we’ll be advertising and telling people about our new and continuing community work, and our new community worship opportunities. There will be flyers, postcards and personal invitations. And when people walk in the door, we’re going to do our best to make them feel welcome, help them get to know one another, and make Trinity a safe and welcoming place for individuals and families looking for a spiritual home.